Touhou Project shoot 'em up known as Maihana Soumakyou in Japan. Shoot ’em up Touhou Azure Reflections, known as Maihana Soumakyou in Japan, is now available for PlayStation 4 via the PlayStation Store for $24.99 in North America and Europe, publisher Unties announced. Users who purchase the game within the first two weeks of launch will receive a 30 percent discount. Dominate levels and relentlessly attack enemies with a variety of skills and upgrades. All three playable characters Reimu, Marisa, and Cirno have heavy hitting spell cards, bullet-absorbing barriers, and a powerful body slam. Azure Reflections puts a spin on the traditional Touhou vertical shooter, boasting intense shoot’em up action from a horizontal perspective. Work towards the high score by blitzing down hordes of enemies and showing off just what the girls are capable of in competitive online leaderboards. Show off the girls’ fashion sense by collecting tokens to accessorize them with and prepare for battle. Accessories are fashionable and functional, improving loadouts with auto-fire, drop rate increases, halved stun time, and more. Famous doujin artists from Croixleur Sigma have crafted a cute and colorful, but troubled world with Touhou Project fan favorites Reimu and Marisa. 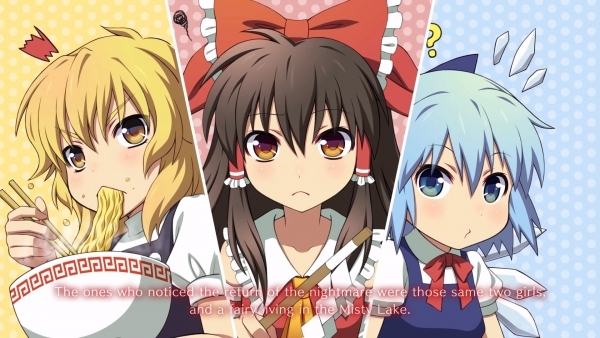 The Ordinary Magician Marisa, Hakurei Shrine’s Maiden Reimu, and The Little Ice Fairy Cirno now must reunite to uncover a familiar evil from Scarlet Devil Manor and protect Gensokyo in this whimsical journey. Azure Reflections’ story branches based on performance against adorably ruthless bosses.